The AIAD is an association of dealers in antiquities (including fine art, coins, metallic and ceramic objects) whose aim is to promote responsible antiquities dealing and to provide a support network and means of exchanging relevant information about fakes, forgeries, fraudulent misrepresentation and stolen good with a view of identifying such items for sale and notifying the relevant authorities. Every member must meet and follow the stringent code of conduct in order to participate in the association. Should you need to check my membership visit this link. 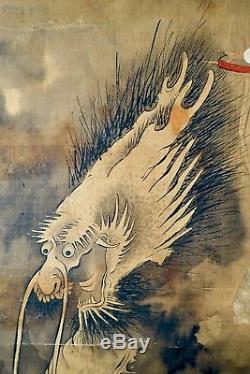 Finely painted ink, colour and gilt on silk depicting a celestial holding the flaming pearl of immortality riding a dragon rising above turbulent dark clouds. 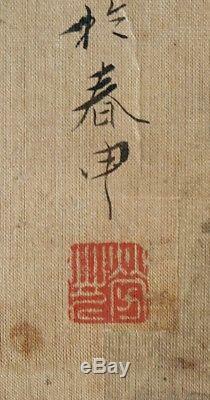 Signed and dated Guangxu reign; one red seal. Painting size: 116 x 40 cm. Condition: Good overall considering age and material, with stains, creases and repairs. Can be provided if requested. This Item is 100% guaranteed authentic as described. If a recognised authority disputes their authenticity. Or if the description is found significantly incorrect. All items are sent safely packaged, registered, signed-for and insured. We will do our best to resolve any problem. 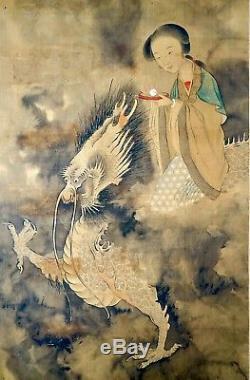 The item "Beautiful Chinese Painting of Celestial and Dragon Signed Guangxu Period" is in sale since Saturday, October 6, 2018. 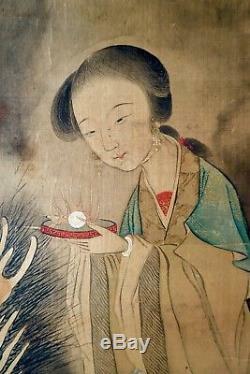 This item is in the category "Antiques\Asian/Oriental Antiques\Chinese\Paintings/Scrolls". The seller is "proto-cultures-art" and is located in London. This item can be shipped worldwide.